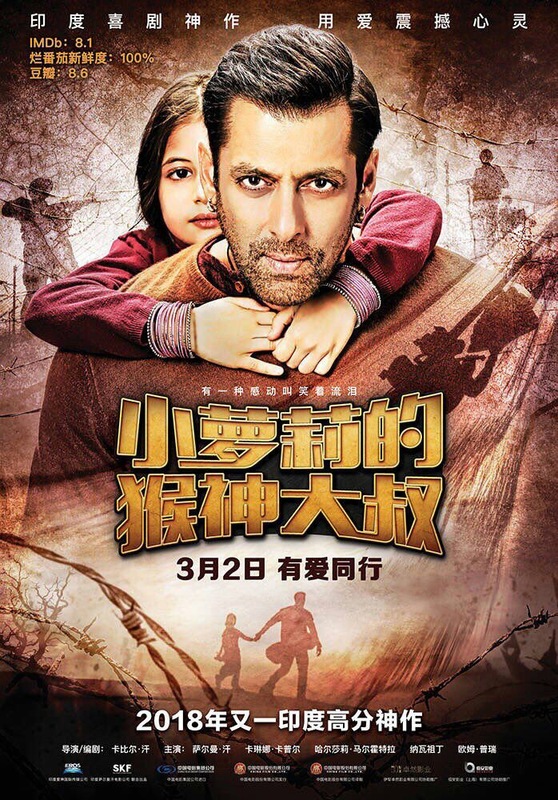 Eros International Media Ltd (Eros International), has announced that in association with China’s E Stars Films Ltd and Salman Khan Ventures that it will be releasing the multiple record breaking blockbuster Bajrangi Bhaijaan in China on 2nd March 2018 during the Chinese Lantern Festival. Dubbed in Chinese, the first Salman Khan film to release in China, the film is expected to get a wide release across 8000 plus screens. The Indian drama directed by Kabir Khan stars leading Indian film actor Salman Khan as Bajrangi, an ardent devotee of Hindu deity Hanuman, and his arduous journey to reunite a six-year-old Pakistani girl – who somehow gets lost in India – with her parents, back to her hometown in Pakistan. With China overtaking the US with the world’s largest screen count with over 41,000 screens against 40,759 screens in the US and the recent successes of Indian film releases in China, the studio and the makers are confident of Bajrangi Bhaijaan’s box office potential in one of the most promising international markets for Indian films. Speaking on the development, Jyoti Deshpande, Group CEO, Eros International said, “China has emerged as an important market and major box office earner for Indian films in recent years, what with the recent success of Dangal and we are delighted to partner with E Stars to showcase our film to China. Our Indo-China co-productions are still in the making which we are extremely excited about, meanwhile what better film than Bajrangi Bhaijaan starring one of India’s most loved superstars that weaves the universal story of cross border friendship to release in a growing market like China. There are no international films releasing during that period in China so we hope to have a fantastic run at the box office in the world’s biggest film market”. Allen Liu, CEO, E Stars Films Ltd added, “We are looking forward to partnering with Eros, one of the leading studios in India. There is high expectation and curiosity for the film post the success of recent Indian releases in China and the positive word of mouth Bajrangi Bhaijaan enjoys. We anticipate tremendous potential in this beautiful drama starring one of the most popular actors in Indian cinema in a film that speaks the language of emotions like courage and hope which are universal”. Eros released Bajrangi Bhaijaan across 4200 screens in India (the highest number of screens for a Hindi film at the time) and over 700 screens in the international markets on 17th July 2015. The film went on to break several records in the domestic and international markets including the fastest 100 crores for a Hindi language film, highest single day collection, highest first Monday collection, highest Eid weekend gross overseas and several more. Bajrangi Bhaijaan is the first of the film associations Eros is exploring with China. Recognising the significant market opportunity in China, Eros and director Kabir Khan are once again coming together for a travel drama, The Zookeeper (working title) under its franchise studio, Trinity which will be shot in Hindi and Mandarin languages.